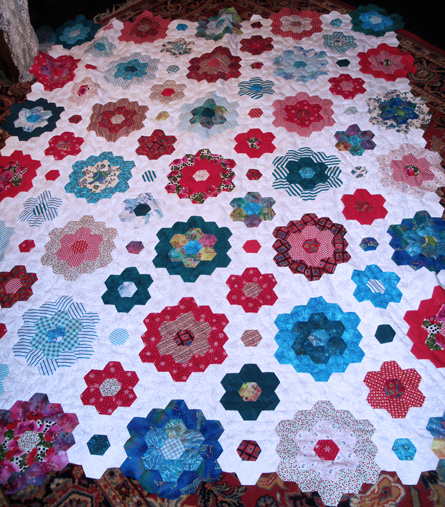 Work continues on the hex quilt. Once I get a progress pic I’ll post this entry to the journal. I finished the hand sewing on the center section of the hex quilt and I am really quite pleased. 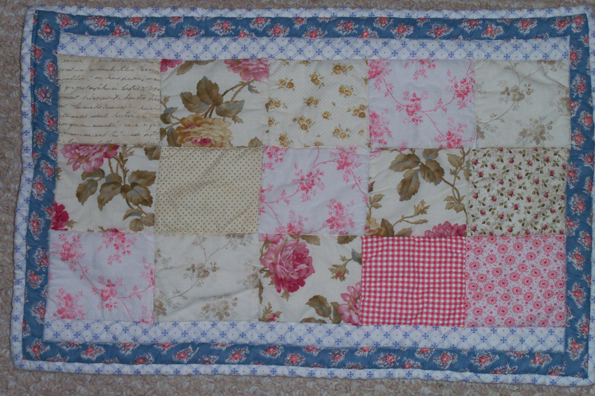 This really is a “me” type quilt and I am very happy with it so far. And hey! I am using up the scraps in the stash. 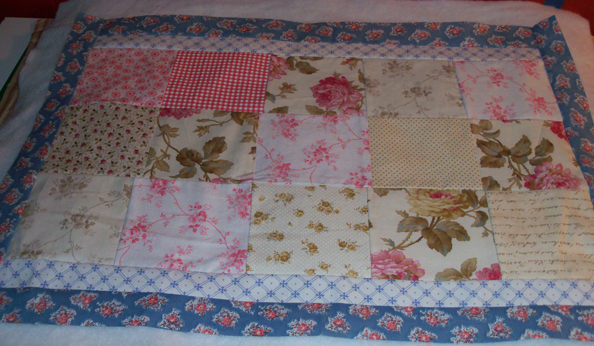 After I finished up all of the morning stuff downstairs I hit the sewing machine and attached the next border sections. This is what it looked like when I finished. 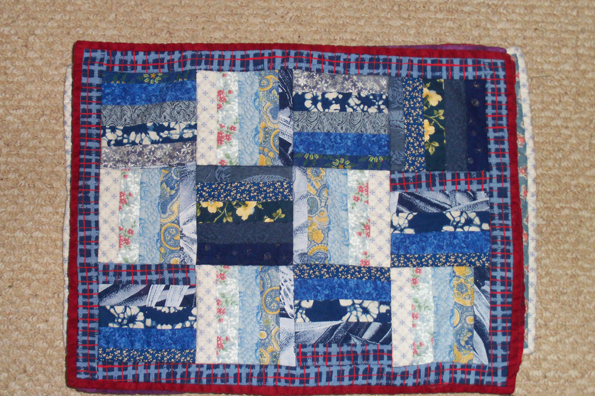 One more small green border and then I am going to have to find something for a larger outside border and binding. You know, there are times I get really pissed off about the way our government works. A case in point is how Kate Cox, a quilter and textile artist is being treated at the moment over her visa. Go read about it and sign the petition. 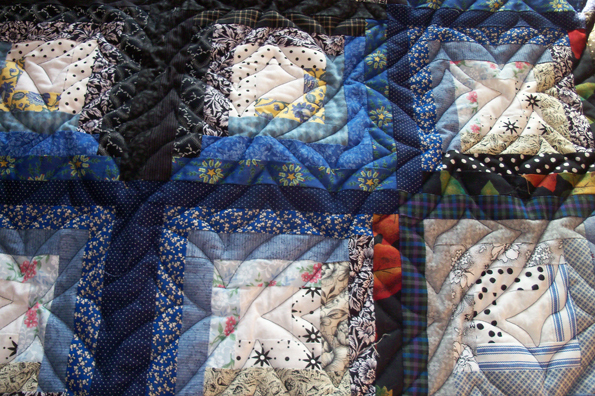 Today is the day when voting opens on Quilter’s Show and tell Spring Quilts event. 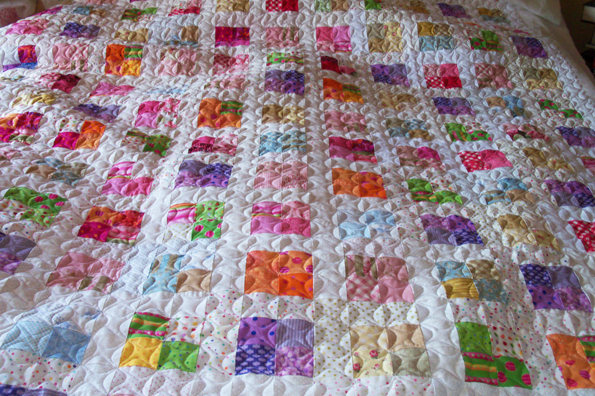 Go vote for Twitterpated and look at the wonderful spring quilts. 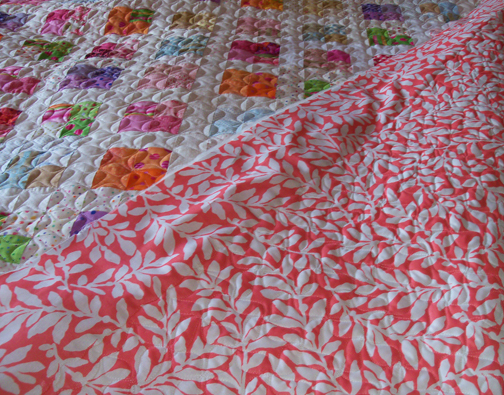 The fabric is all cut for the new quilt project and hopefully I can get it into a layout while the sun shines today – its hard to see some of the colors in the evenings. 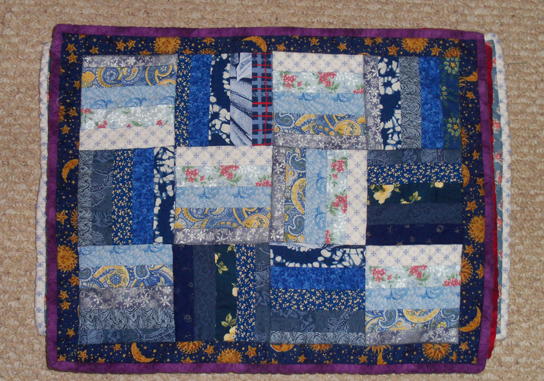 Friend Cheryl emailed me last night that she finished quilting Twitterpated. Oh my gosh! I can start putting prairie points on the thing. 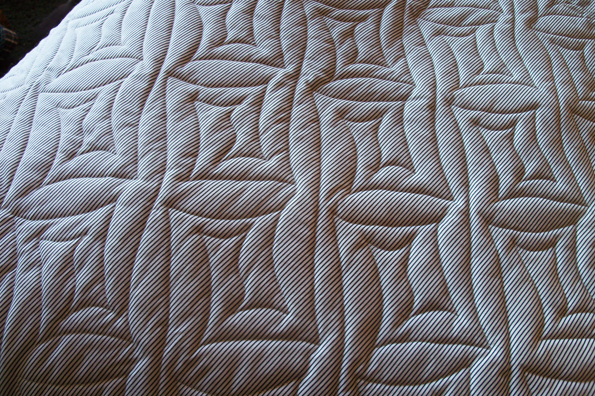 I went over this morning to pick the quilt up so here are a few pics of it right off the quilting frame. Cool. Last night friend Cheryl stopped by to give me back the scrap utility quilt I made for our friend and catsitter that I finished a while back. 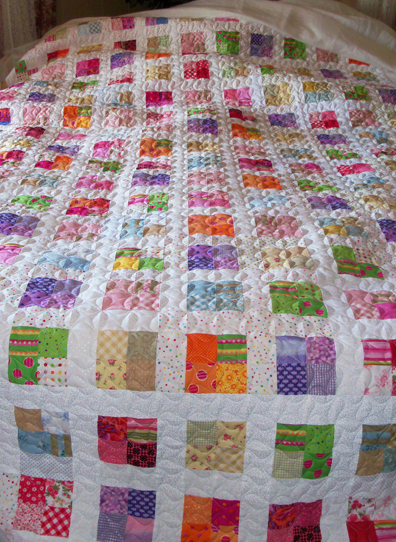 She did such a great job quilting it. 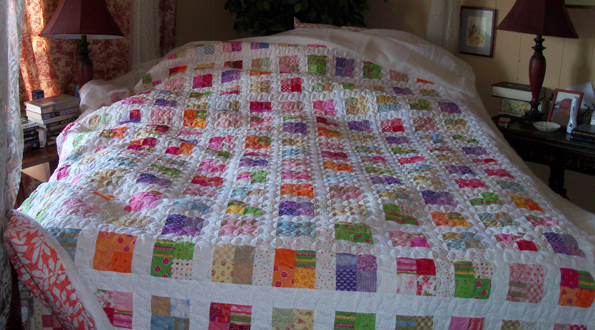 She used a wool batting that feels soft as silk and I can’t wait to nestle under it and sew the binding down – always my favourite part. Yes, even though I don’t really like the color combo I have to admit that it turned out beautiful. 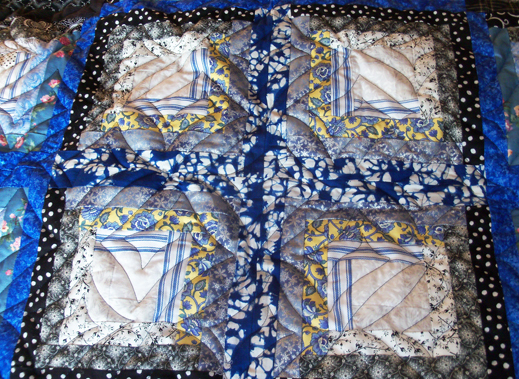 Cheryl even centered the quilt design! The log cabin blocks have a ever increasing/spiraling square on them and in the end it looks like circles on squares. Note: this is a really good use of a panto folks. 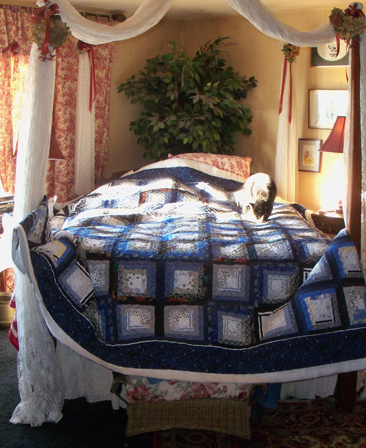 And yes, I no sooner had the quilt on top of the bed so I could take pictures but there were cats on it as you can see. 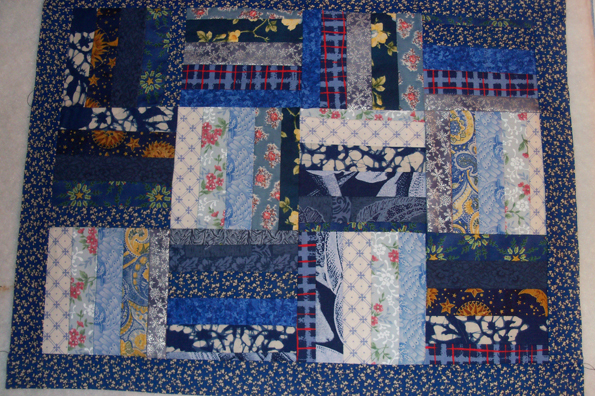 Here's that crazy busy center square showing the centered quilting design. I came down this morning and realized I had not seem Ms. Trouble so I looked all over the house for her. Much later I finally found where she had been. In the cat basket under the cat quilt. I went to deliver the cat blankets to the shelter and they had closed early. I will just have to run them up today. 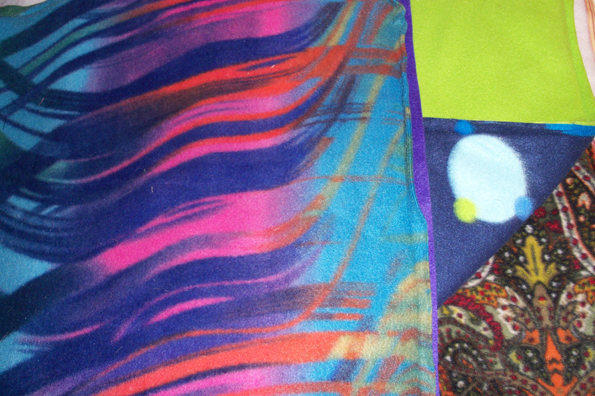 I didn’t take pics of the fleece squares or the duplicates of the blue ones. Our local shelter put out a call for blankets. It seems that our hurricane put a strain on their resources. 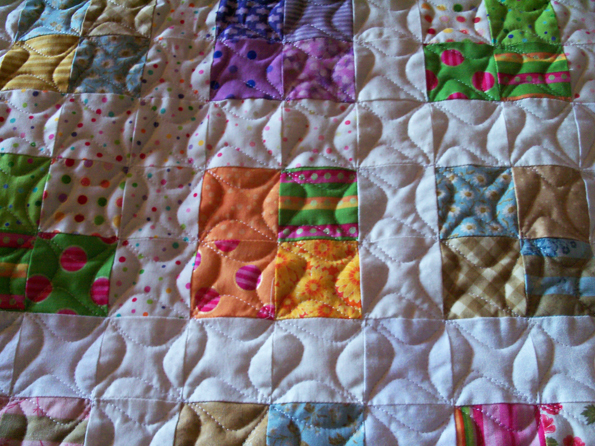 Not the most exacting piecing but they are purely for utility. The cats and dogs at the shelter each get their own fresh blanket every day. I think the washer and dryer up there must go constantly. So there are 3 fleece, 1 pink and 4 versions of the blue. I managed to get the batting and backing cut before going to sleep so I just need to do some minimal pinning and quilting. The quilt top is finished! 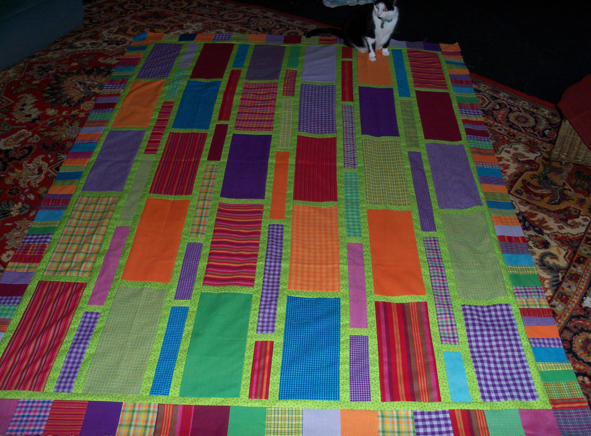 A scrap quilt that I promised to make for our cat sitter ages ago. Now, I have to design something for our nieces wedding gift. I didn’t spend any time out in the back garden today since I have a few blisters from what I did the other day. 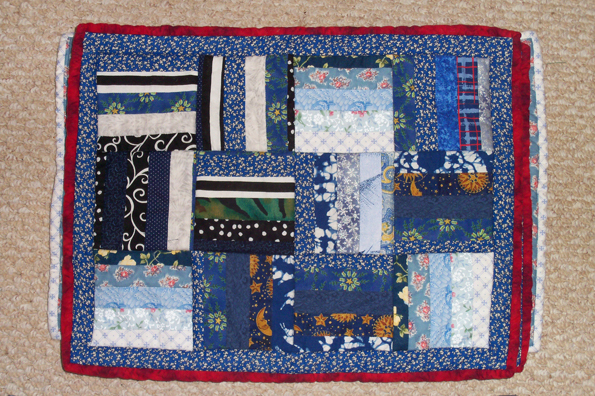 Instead I used old quilting scraps to make two small cat quilts that are almost done – need to put on the bindings. The first one is finished and the second is ready to receive its binding. As you can see Ms. Trouble seems to like the new quilt and the new cat basket that Dearest got when he won all those vedgies. 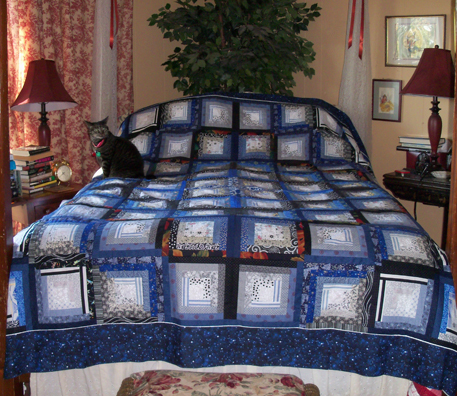 I also took the scrap crazy quilt pieces out of their box and pinned them up – cats like to knock them off if I don’t pin them. Looks pretty funky and there are not enough done to do anything with so they will go back in the box and more will slowly get added to the pile.